A three-week engagement at my family's VILLA HEIGHTS DRIVE-IN is correct. A full lot EVERY night. 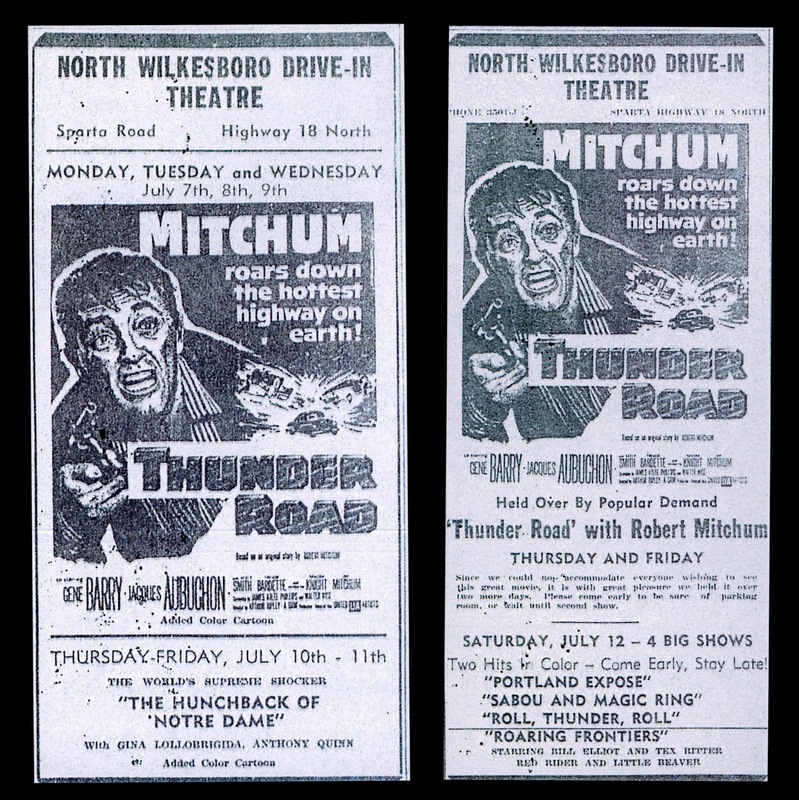 Two showings nightly, EXCEPT the first Friday-Saturday a second feature was added. (We ALWAYS had double or triple bills on those nights.) Complaints verbally made to my Dad, who ran the place, "We'd rather see TR twice than to see another movie," they said. So the following two weekends of TR's run, it played solo. A phenom it was, that summer of 1958. Nothing else, in our 13 years of exhibition, came close. GWTW and OLE YELLER ran a week, which was extraordinary. The remaining BIGGEST pictures of the 1950's ran three nights. Having free rein to roam the 450-car field whenever I wanted, I recall fondly the THUNDER ROAD nights. Shortly after the engagement, I remember my father coming home one day in a new family auto, afforded probably by the coins in the family coffer provided by Mitchum and his movie. Yep, "Moonrunners" was indeed the inspiration for "The Dukes of Hazzard." 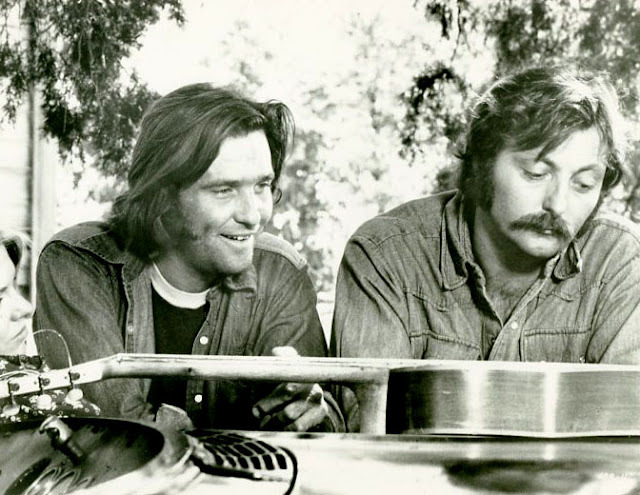 Elements of the movie that ended up in the "Dukes": Uncle Jesse, Sheriff Roscoe Coltrane, the Boar's Nest saloon, and Waylon Jennings' narration. 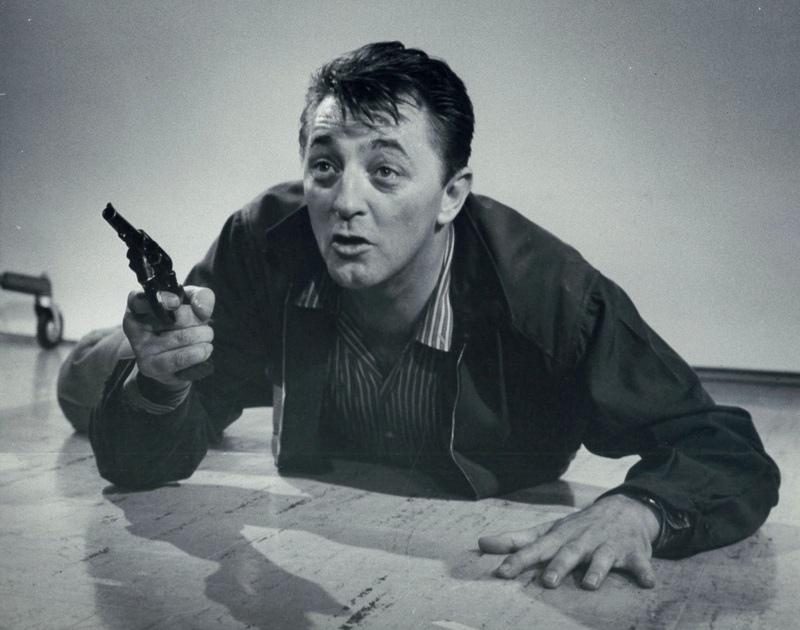 Differences: Kiel Martin (later J.D. La Rue on "Hill Street Blues") and Jim Mitchum were the Hagg boys, not the Dukes, and they hailed from Shiloh County; their car was called Traveler (after General Lee's horse) and it didn't have a Confederate flag on its roof; there was no Boss Hogg as the villain was rival moonshiner Jake Rainey. North Carolina may have been the prime THUNDER ROAD territory, but it fared pretty well elsewhere too. 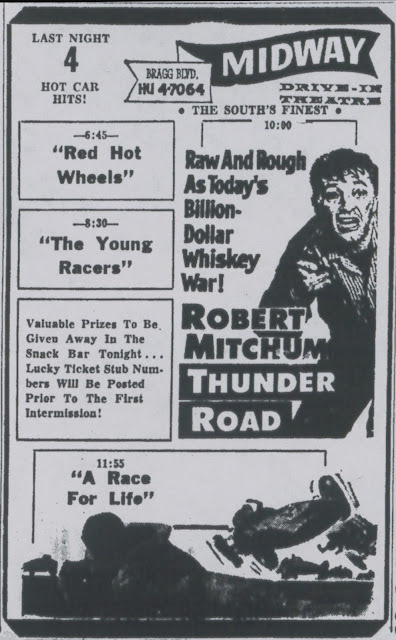 I grew up in the Louisville, Ky. area and when I was still a kid, I started noticing that THUNDER ROAD always seemed to be on the bill at one of the local drive-ins. Sometimes leading off, sometimes in support, but it always seemed to be there somewhere. 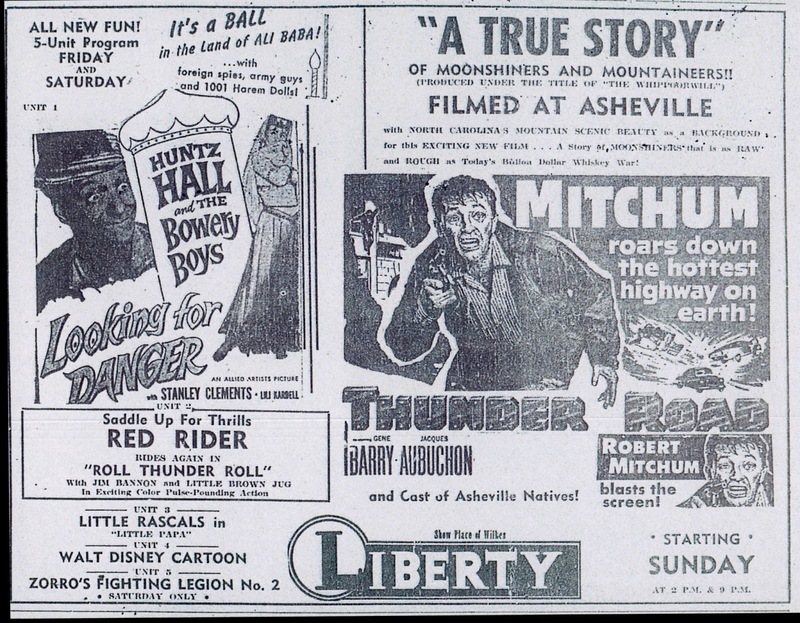 My first viewing of TR was at a Louisville drive-in, somewhere between '69 and '72. I hummed or sang the title song for a month afterwards. Matter of fact, it's running through my head right now. Just watched it. Great movie. Would not have without this post. Thanks. One more bit of weird trivia: "Thunder Road" footage of a '57 Ford crashing was used in David Bradley's notorious turkey "They Saved Hitler's Brain" (made even more infamous when new footage shot in the Philippines was tacked onto the film a decade later; they even managed to find a '57 Ford to match the "Thunder Road" footage). I remember watching THUNDER ROAD on the late show (10:30) one Saturday night in the early 60s when I was a kid. 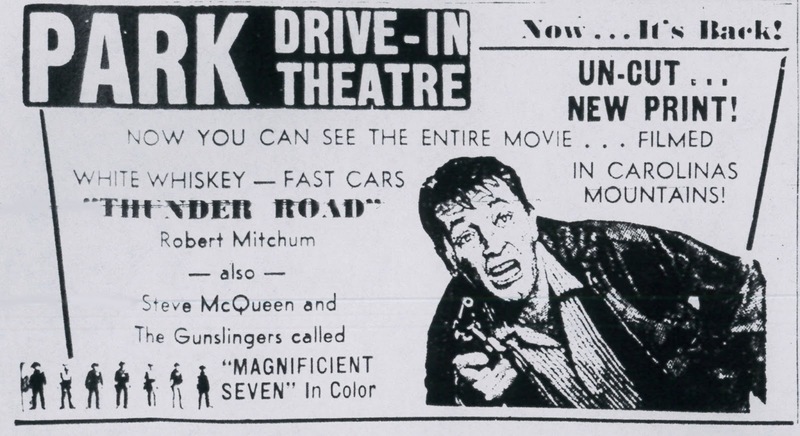 In addition to the newly released BRD, THUNDER ROAD will be shown on Turner Classic Movies later this month, presumably in HD.